When I joined DevChat, I had no idea what I was in for. In this article I’ll talk about my experiences on there, and why you should totally join. NOTE: I am not being paid to promote this, I just think that DevChat is a really good thing that will help you all. In early September of 2017, I realized something. I had been coding for over two years, and had never made contact or chatted with any other developers other than ones I knew in real life. Ever. So, I had a look around the internet and I finally came across this article. In it were 46 different Slack groups, all related to programming! I had used Slack a couple of times before for collaborations with people I knew, so I was already basically familiar with the layout of Slack. For anyone who doesn’t know, Slack is basically like text messages except with a bunch of people, and there are different chat areas, known as channels. In addition, you can also have direct messages with members. I had a look through all of them, and many of them had since shut down or had very little activity. I ended up clicking on DevChat, and that was it - on the 10th of September 2017, I signed up to DevChat. The first thing that I did when I got on was to say hi in the #intro channel (channels start with #). I was greeted with a very warm welcome, and already felt like a part of the community. Already I was overwhelmed with the general niceness of the community (more on that further down). I got into the spirit, had a few chats with people and even welcomed a few people who came after me! I was super-happy and really excited that I joined the community. I forgot exactly how it happened, but I think it was in #intro - I got talking to this cool guy called @Nythiennzo. He was talking about how he had just begun this course on making a programming blog (you can see his one here). I was interested, because for almost half a year I had been procrastinating on making a blog of some kind, but had no direction (you can see the horrible start of what I had here). He mentioned a guy called Simple Programmer, and how he was completing a blogging course made by him. @Nythiennzo suggested that I should sign up if I was interested in making a blog, it was free. I signed up, and completely forgot about it. Anyway, a few days later I got an email with the first part of the course (it was an email course). Normally when I sign up to these sorts of things, I usually take a skim through and think “Yeah, I’ll save that for some other time”. In fact, I wasn’t even planning on doing the course as it came. However, the emails were all asking me to take action, and before I knew it I was waiting eagerly for the next installment every Tuesday and Thursday. So I completed all the homework, and that’s how Code The Web was born! Once I had put money on a domain, I knew I was committed and this was something that I wanted to do. So, let’s have a look at some of the reasons why you should join! Something that really struck me when I joined DevChat was how active the community was. Every day there are many different converations and threads all of which are interesting even if you’re not involved (I’ll speak more about that in reason #4). Also because there are people from all over the world in different timezones, there are always people online. You can turn off or limit notifications if the chatter gets a bit much. DevChat is a wonderful place to get help with programming problems or if you are stuck. The community there are really nice and also very smart, more often than not someone will be willing to help you (Note: if you want a place to purely ask questions without the hanging, check out StackOverflow). A little bit after I joined, I was working on a complete redesign of my website and logo. After I had finished, I was a bit nervous. I was happy with the look and feel of my site, but I had had the same design for ages and was very used to it. So I decided to post it in #webdev and ask for feedback. I expected maybe one or two people to look at it briefly and say “Yeah, its good” without any actual feedback, but I was wildly wrong. The feedback people gave was amazing. They went into my actual source code and asked why I wasn’t putting my <ul> in a <nav>. They told me to increase my font-size and line-height for readability. They told me a bunch of cool stuff and were also very responsive if I had any further questions. The feedback ranged from responsiveness to readability to SEO (search engine optimization) to performace. With their help, I made my website load in one seventh of the speed (1.1s), and score a solid 97% on Website Grader. The point is, the people on DevChat are very happy to give feedback and enjoy doing so, and have some really valuable wisdom. Shoutouts to @mpalmer, @eden, @maerinas and @ryanh over in #webdev. Every time I go on DevChat, I see so many people chatting away. Often I have no idea what they’re on about, but often there is stuff to learn from it. By taking a look at other people’s conversations, you can learn multitudes. You may also discover new libraries or languages. You see, you will always learn something new on DevChat even if its not what you came there for. Every time you go on DevChat, you are building a new door. You never know what opportunities will suddenly hit you in the face on there - if I hadn’t been of DevChat at that specific time, Code The Web might not even exist! All in all, DevChat is a great place to discover new things and learn new stuff. DevChat is a global community of like-minded developers, from beginners to expert proffessionals, from Australia to India to Nigeria to South America, from high school students to people in their 50’s. And everyone in DevChat is brought together by one thing - programming. The stereotypes of anti-social programmers sitting in front of the computer all day is false - there are over 7,000 programmers on DevChat, many of whom are an active part of the community. With so many programmers in such different situations, it is really cool to see how programmers differ across the world and across cultures. On DevChat you will make many international connections that you may never forget. 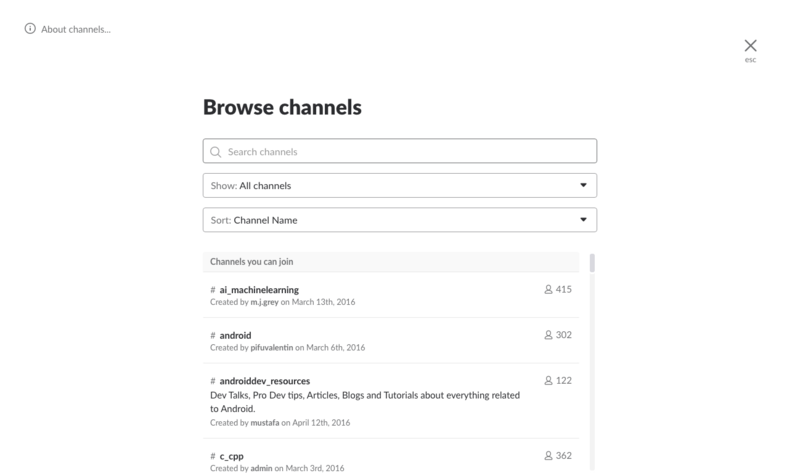 There is also a #jobs channel, so that’s the place to go if you are looking for work. I am not sure how many people have gotten hired via there because most of that would go on in Direct Messages, but I assume surely some people would have with all the people looking for work as well as recruiters on there all the time. Okay. So you’ve read this far, and I’ve hopefully convinced you that you should join DevChat. It’s free, and you have nothing to lose. Simply enter your email, then check for an invitation which will come shortly after. Wait! Don’t leave yet! Don’t you want to know how to get the most out of DevChat? From there, you can scroll through the channels - you will be amazed at how many cool ones there are! You can also welcome others in #intro. This will help you feel more like a part of the community and also help other people! If you need help, don’t hesitate to ask a question. Also if you know the answer to someone else’s question, answer it - it will help them and make you feel good. Only ever post anything in one or occasionally two channels, and don’t be spammy. The people here are genuine, and so are you. Don’t self-promote unless you are introducing yourself, posting in #jobs or talking about your programming progress (and no corporate advertising of course). DevChat does have some rules, although they are very simple and not hard to follow. Follow them and people will like you. The more you interact with the community, the more you will get out of it! If there is someone you have talked to, you could consider hopping on Direct Messages with them and talking more. Also, I’d just like to thank @mustafa and @eden for creating DevChat, we all really appreciate it and it is really a great community. Join DevChat, you will meet cool people, open new opportunities and have lots of really kind people by your side, as long as you are nice and follow the rules. If you liked this article or know a friend who this might interesting, I would really appreciate it if you shared it. Also I’d really appreciate it if you signed up to the newsletter. If you have anything to say about this article, have feedback or just want to say hi then you can in the comments. I’d also love to hear what you thought, because this article was a little different to usual. Have fun, and hopefully I’ll see you soon on DevChat! Next time I’ll be talking about CSS display types. See you then!